Ever since Mazi Nnamdi Kanu the leader of the Indigenous People of Biafra (IPOB) has educated his people about the divide and rule strategy which the Nigeria government used to turn Biafrans against each other in the past, it has become a forgotten issue until the recent visit by the acting vice president Yemi Osibanjo. Lately, he has been taking some certain decisions and actions of his own, which makes people of good thinking to ask the question is President Muhammadu Buhari dead? Because it seems so, giving the way some northern politicians have come out to openly warn Osinbajo that the presidency doesn't belong to him. It is quite obvious that Buhari exempts Prof. Yemi Osibanjo from crucial meetings concerning key decisions in Nigeria not to talk of allowing him to represent him in public functions when he was in power. Rather, he appoints a representative from his cabinet. Recall that Buhari has embarked on medical trips outside the country for three (3) good times since assumption of office. During these absences from office, it is quite surprising that Yemi Osibanjo has never taken actions on his own due to the heavy influence of his superior, Buhari. Suddenly Yemi Osibanjo is now taking decisions and actions by his recent visit to the major oil rich region of the country which is Niger Delta. On 14th February, 2017 Yemi Osibanjo paid a political visit to the chairman of the traditional rulers in Imo State, Eze .A. Ohiri asking him to instruct all the traditional rulers under him to see that there is a clamp down on the agitation for Biafra restoration. Unfortunately, this political movement came at the wrong time as 89% of IPOB in Imo State and beyond have been educated on this kind of movement and are seriously waiting for the date of referendum to be announced. Glory to Chukwu Okike Abiama as Ohaji Egbema and Uguta traditional rulers refused the offers given to them by the Nigeria acting president Prof. Yemi Osibanjo. 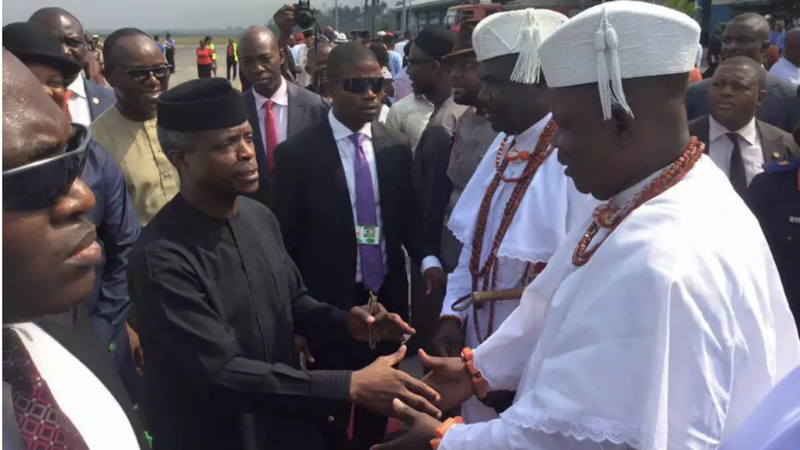 In another way round, Osibanjo's sudden visit to Niger Delta region is a way for us to be intelligently aware that Buhari might be dead which the presidency is keeping a secret till now. The leadership of Indigenous People of Biafra have advised all Biafrans not to be deceived by the Hausa-Fulani and Yoruba people who are like green snakes on green grasses and think nothing good of Biafrans. Furthermore, our obligations as Biafrans should always be to put heads together and work for the betterment of our beloved Nation Biafra with Esprit de corps being our watch word! IT IS ONLY A FOOL THAT WILL CONTINUE DOING A THING EVERY NOW AND THEN.THE CASE OF DIVIDE AND RULE IN BIAFRALAND SINCE 1960S IS OVER BUT THE LATEST FOOLS GAME BY OSINBAJO AND HIS YORUBA MISCHIEF IS DEAD ON ARRIVAL. BIAFRAN REPUBLIC IS THE WAY,TRUTH AND LIFE AND NO MORE SHALL YORUBAS AND THIER ISLAMIC NORTH CRIMINALS HAVE ANY ROOT TO STEAL,LOOT,HIJACK,MARGINALIZE,UNDERVELOPE,SUBJUGATE IGBOS AND BIAFRANS AGAIN! NEVER! WE SHALL HAVE BIAFRAN REPUBLIC SEPARATE FROM YORUBA-HAUSA-FULANI GRIP AND BIAFRANS ESPECIALLY IGBOS WILL DEVELOPE,BUILT BIAFRALAND BEYOND THE IMAGINATION OF RESOURCE THIEVES IN YORUBALAND AND OTHER CRIMINALS CLAIMING ONE -NIGERIA. SORRY,YOUR MANY YEARS OF LOOTING BIAFRANS AND DIVIDING BIAFRANS IS OVER WHILE LAGOS,YORUBALAND AND HAUSA-`RECEIVED BIAFRANS RESOURCES FOR ITS DEVELOPMENT. THE END HAS COME#BIAFRA OR DEATH.GO BACK TO YORUBALAND OH OSINBAJO AS YOU ARE NOT WELCOMED IN BIAFRALAND OK.#BIAFRALAND 4BIAFRANS#ODUDUWA4YORUBAS#AREWA4ISLAMIC TERRORIST.URS THE BIAFRAN RABBI.